A Target store in Pennsylvania has been ordered by a jury to pay $2.1 million to a woman who tore her hamstring after slipping on one of the store’s wet floors. In this issue, we’ll talk about the specifics of the case and share information on steps you should take if something similar happens to you. The woman was shopping at the Target store on behalf of her co-workers. Just before she entered the store, however, a bottle of soda had fallen from a shelf and spilled onto the main aisle. Some Target employees did begin mopping the area “with a wet and soapy substance,” and placed warning cones around the wet area. The employees, however, continued their mopping well outside the cordoned-off area, leaving an invisible wet floor. Even though the victim walked cautiously around the cordoned-off area, she slipped on the wet surface beyond the cones – tearing her right hamstring out of her hip socket. The victim underwent surgery to repair the injury and spent quite a bit of time in a body brace so that her injured leg would remain immobilized. Even though Target tried (unsuccessfully) to claim that the victim was at least partially responsible, the jury thought otherwise. Before you leave the site, it’s vital that you document the incident with the business, individual or organization. Not doing this means that you could lose out on valuable evidence, including video surveillance, witness identification, etc. Injuries from falls can take a while to manifest themselves. Serious and long-lasting damage – often not seen or felt until days later – can easily be done to your muscles and tendons. A full examination complete with documentation is key to proving your injuries. 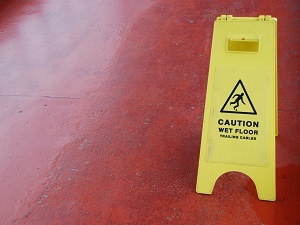 Each year, at least a million people are treated in emergency rooms for injuries sustained in slip-and-fall incidents. If this happens to you, the person responsible for the conditions that lead to your fall should pay for your recovery. Get in touch with us here at Barber & Associates. The first consultation is always free.